Puerto Rico is burning oil to generate electricity: It’s completely insane. 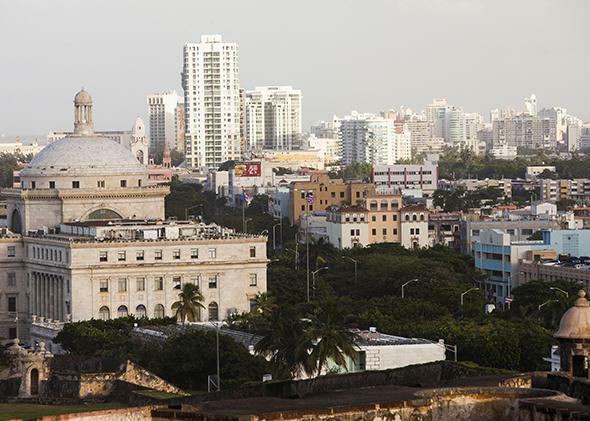 Puerto Ricans, such as those who live in Old San Juan, pictured, use less energy per capita than mainland Americans, but get it from sources that make no sense. PREPA, the troubled Puerto Rico Electric Power Authority, is having difficulty coming up with the money to pay for its latest petroleum delivery. As Caribbean Business reported, the utility last week decided to take cash from its capital works fund—up to $100 million—to buy oil. Usually, PREPA would use existing lines of credit to make such purchases. But the recent downgrades of Puerto Rico’s public debt have made that more challenging. Puerto Rico has a host of problems. Its economy has been in recession since 2006, and investors are fretting that it may not be able to make good on its $70 billion in municipal bonds. A goodly chunk of its population has decamped to Florida. In the scheme of things, borrowing from an infrastructure fund to pay for fuel oil seems like a drop in a very large bucket. Nonetheless, WTF? Why is Puerto Rico buying $100-per-barrel oil to make electricity? There are lots of ways to generate electricity. You can burn fossil fuels like coal, or natural gas, or oil. You can harness the power of rushing water, or the light of the sun, or the wind. You can burn biomass, or garbage waste. Or you can tap landfills for methane gas. Among these many options, none possesses the lethal combination of high costs and deleterious environmental impact that torching petroleum does. According to the Environmental Protection Agency, burning oil to create electricity emits about 50 percent more carbon dioxide per megawatt-hour than natural gas and only about 25 percent less than coal, while producing nearly as much sulfur dioxide and nitrogen oxides as coal does. Meanwhile, with oil at $100 a barrel, shipping in oil over a long distance and then burning it is an extremely costly way of generating electricity. That’s why America has pretty much given up on petroleum as an electricity-generating fuel. According to the Energy Information Administration, petroleum liquids accounted for about 2.5 percent of U.S. electricity generation in 2004, or 100,391 thousand megawatt-hours. By last year, that amount had fallen by 86 percent, and petroleum liquids accounted for just 0.3 percent of total electricity generation. In general, the U.S. electricity fleet has swapped in cleaner-burning natural gas and renewables for coal and oil. Not so much in Puerto Rico. As the Energy Information Administration notes, in 2012, “65% of Puerto Rico’s electricity came from petroleum, 18% from natural gas, 16% from coal, and 1% from renewable energy.” As PREPA’s list of major power plants shows, many of its biggest plants use either fuel oil No. 6 (the heavy, dirty version that New York City has banned), or Fuel Oil No. 2, which costs about $3 per gallon. (Here’s a long-term chart of heating oil No. 2.) Would it surprise you to learn that Puerto Rico’s electricity costs—at about 27 cents per kilowatt-hour—are about twice what they are on the mainland? The continued reliance on oil is both a symptom and a cause of Puerto Rico’s woes. The high electricity cost functions as a tax on business and industry and as a pernicious regressive tax on consumers. Historically, island states, such as Puerto Rico and Hawaii, that lack their own supplies of natural gas and coal haven’t had much choice but to rely on petroleum. And to its credit, Puerto Rico is trying to pump up its use of natural gas. One of the biggest plants on the island, the 540-megawatt EcoEléctrica facility, runs on fuel that arrives by ship as liquefied natural gas from Trinidad and Tobago and is processed at the Peñuelas terminal. The same terminal, on Puerto Rico’s southern coast, also feeds the nearby Costa Sur station in Guayanilla, which has been converted from oil to run on natural gas. But Puerto Rico lacks the expensive infrastructure (new terminals, pipeline networks) to convert all its oil-fueled plants quickly. Worse, it lacks the capital and borrowing capacity to build this infrastructure. Pumping up renewables would help, too. Renewables can’t be relied upon for what’s known as base load—the sun doesn’t shine at night, and the wind doesn’t always blow. But sun and wind can be a significant part of generation—wind farms planted strategically on mountain ridges, or solar panels arrayed on unused farmland or on the tops of big-box stores, schools, and homes. In Texas, wind alone accounts for about 10 percent of electricity generation. On a weekend day in March, solar alone accounted for about 18 percent of California’s electricity. As this cool, daily, real-time chart from Hawaii’s biggest utility shows, during the middle of the day, renewables can easily supply up to 20 percent of Hawaii’s electricity needs. But Puerto Rico, where the typical person uses only about 40 percent of the amount of energy of a typical American, is behind the curve when it comes to renewables. As EIA notes, “Only about 1% of Puerto Rico’s electricity has been coming from renewable energy sources, all from hydroelectricity.” Building more solar and wind projects isn’t just smart energy policy for a tropical island state like Puerto Rico; it’s smart economic development policy. Doing so would create jobs, help incubate new industries, and provide cheaper electricity, which would be a boon to consumers and businesses. Law 82, passed in 2010, stipulates Puerto Rico should get 12 percent of its energy from renewable sources by the end of next year. But that seems like a pipe dream. Yes, a few wind farms are up and running, and the first large-scale solar plant went live in 2012. And there’s now a 24-megawatt solar plant at Guayama, a 26-megawatt solar PV plant at Loiza, and a new 5-megawatt installation atop a convention center. NRG is working on a 52-megawatt project in Juncos, spread over 500 acres, and earlier this year, it was reported that half a dozen companies were given the green light to proceed with new solar plants. But to gain critical mass, Puerto Rico needs all these and dozens of other plans to get approved, financed, built, and connected quickly. And that requires the active cooperation of PREPA, the dysfunctional, struggling power authority. In an article in Caribbean Business earlier this week, Julian Herencia, executive director of the Puerto Rico Renewable Energy Producers Association, accused PREPA of reopening solar agreements that were struck under the prior administration, holding up projects, and generally dragging its feet. Puerto Rico is stuck on oil in large part because it lacks the funds and capacity to build new distribution and finance the rapid rollout of renewables. And it lacks the funds and capacity in part because it is stuck paying such a high price for electricity due to its dependence on oil. Catch veinte-dos.